It is easy for me to see the weekly progress with growing of the bridge - this is what everyone sees. But where did the pieces come from? Where are the unsung heros that build the tinker-toys that the bridge builders use to erect a bridge? It is difficult to look behind the scenes, but the Internet is changing that. 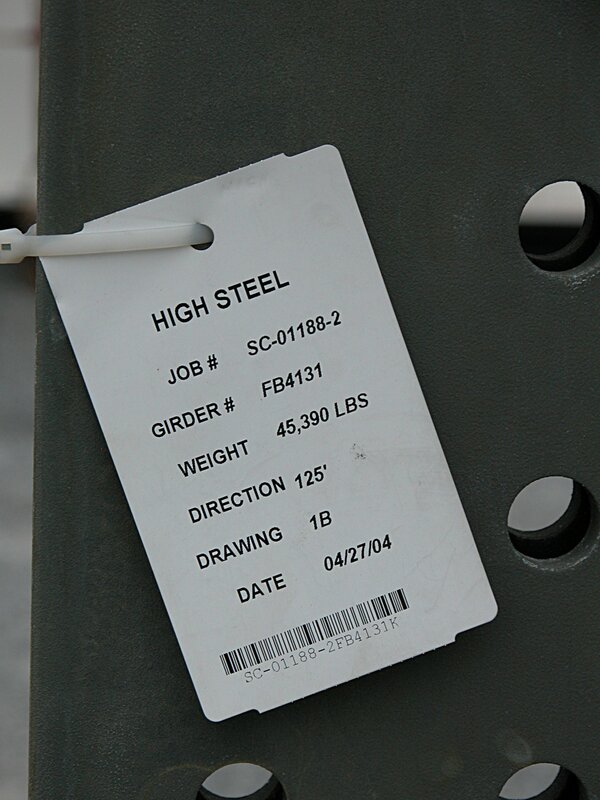 Bill Mankin of High Steel Structures, Inc found my early photos and sent me email - encouraging me to continue. As Bill said - we make the pieces but rarely do we see the finished product. So here is a story about one of the behind-the-scenes players in the building of the new Cooper River Bridge . It all starts at a nearby steel mill where huge sheets of flat steel are made (my next project: visit a steel mill and learn about making steel) and delivered to the yards of High Steel Structures with fabrication facilities in Williamsport and Lancaster (and probably other places I don't know about). The triple anchor edge girders specifically were fabricated in Williamsport facility. 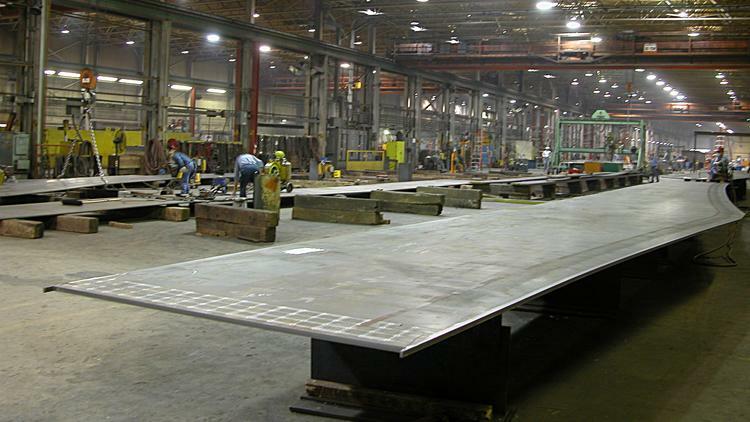 Bill Mankin is the Chief Fabrication Planner for Lancaster based High Steel Structures. 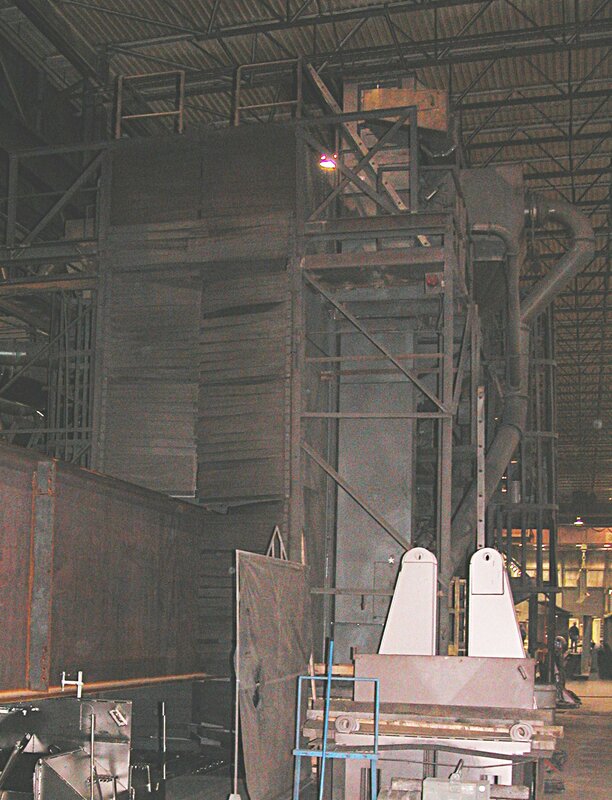 Bill has spent many years working for High Steel and currently is responsible for the review of complex fabrication and writing/reviewing complex fabrication procedures with the shop personnel. What this really means is that he is an ace problem solver. He receives engineering drawings and sometimes detailed drawings - all two dimensional representations of a three dimensional structure. From these he has to figure out how to convert 2d line drawings into 3d bridge parts. Part of this is from experience and his computer guys help with 3d visualization. But Bill's real genius is that he relies on "real intelligence" and builds 3d mock-ups of parts. Only after he can visualize the 3d structures does he turn his team loose on building the pieces. It starts with flat steel resting here inside of "Building 2". Here the steel is cut, pieces welded together, drilled, cleaned and eventually painted. Watching these guys work is like watching a symphony perform. Everyone knows what their part is and how their work fits into the overall composition. Here are built the finished bridge elements: shark-fin beams (anchor beams), floor beams, field splice plates - and so many more that I cannot remember. Shown here are the last two anchor beams that will join the east deck with the east approach. And here was an interesting lesson in how to make all the pieces fit together. All the other beams are cut and drilled according to the drawings. But the last beams require the fine touch of "reality" - and cannot be cut and drilled until the "real" distance between the deck and approach is precisely known. Note the size scale - size of the men compared with the height of the anchor beam. 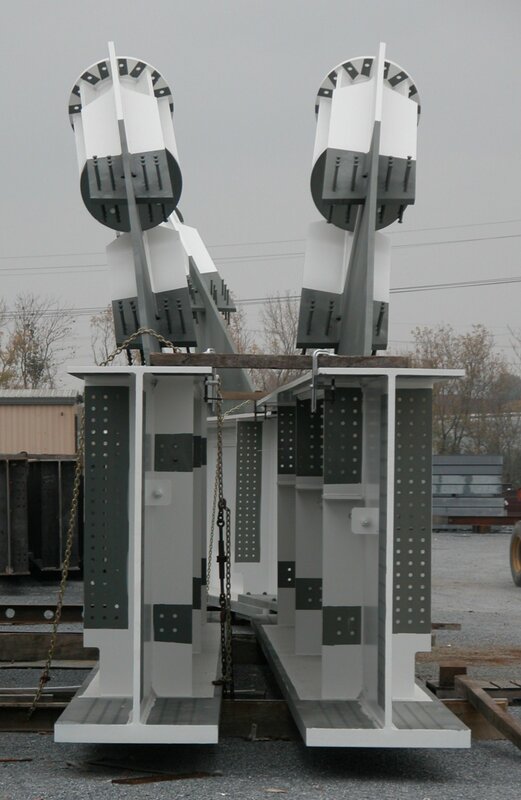 Shown here are the last two anchor beams that will join the east approach with the east deck - waiting to be cut, drilled, shipped and erected sometime in late November or early December. 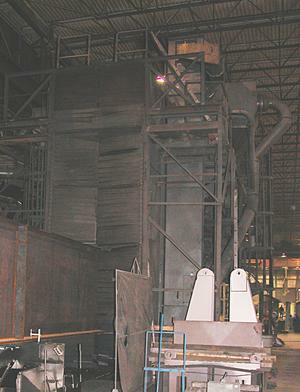 On the left is a beam being fed into the mouth of a blaster that cleans the beams by blasting them with small metal pellets. What is the size scale of these bridge pieces? One way to answer this question is to know how much each beam weights? Check out the documentation. 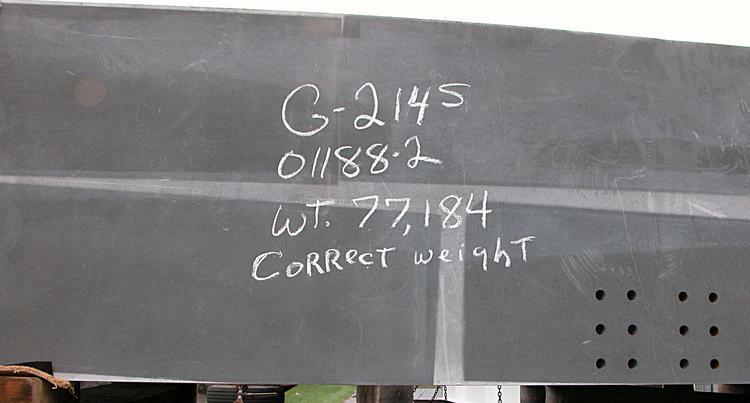 Here, about 22 tons/beam. and floor beams also waiting for their turn for a ride. Ever think about hauling these beams down an interstate highway and negotiating off ramp turns - for example the I95-I26 intersection? Gives new meaning to driving skill. Note the splice plates on the ends - to be sandwiched between splice jaws on the anchor beams (above). 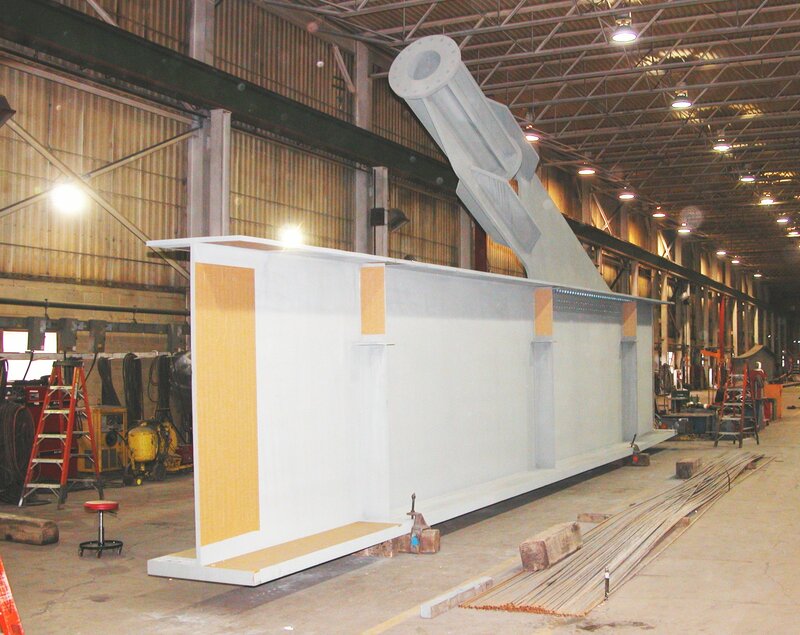 Now think about the crane operators that lift the floor beams into position and then slide the spice plate into the receiving splice place on the anchor beams - and doing both sides of the beam at the same time? Here is a detail that I missed while on the bridge deck. 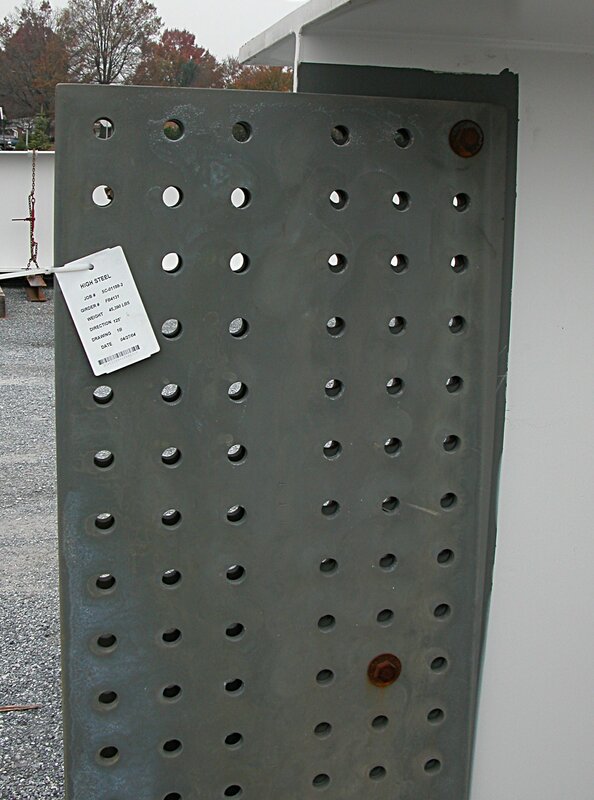 Note (right) that the anchors are bent in the direction of the floor beam splice plates (the plat below the anchor with holed for receiving the floor beams). Each pair of anchors is bent to align the cable with its termination point on the main pylon. 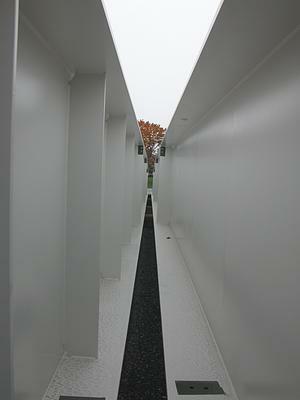 The right photo shows a pair of floor beams with baffles on one side. 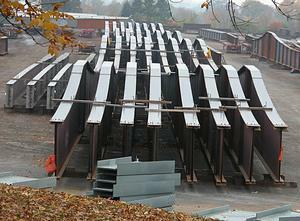 And to keep the High Steel guys off the streets at night - here are girders for to another bridge. 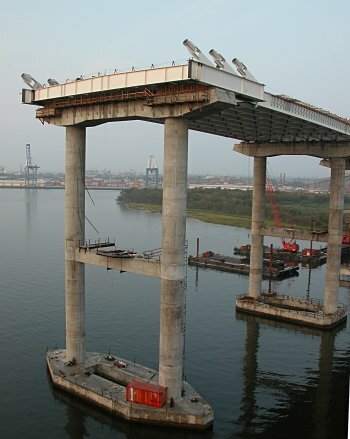 Here, bridge sections are erected in order to correctly size the bolt holes. The holes are predrilled and undersized. Only after the sections are joined and aligned with drift pins are the holes drilled to the correct size.